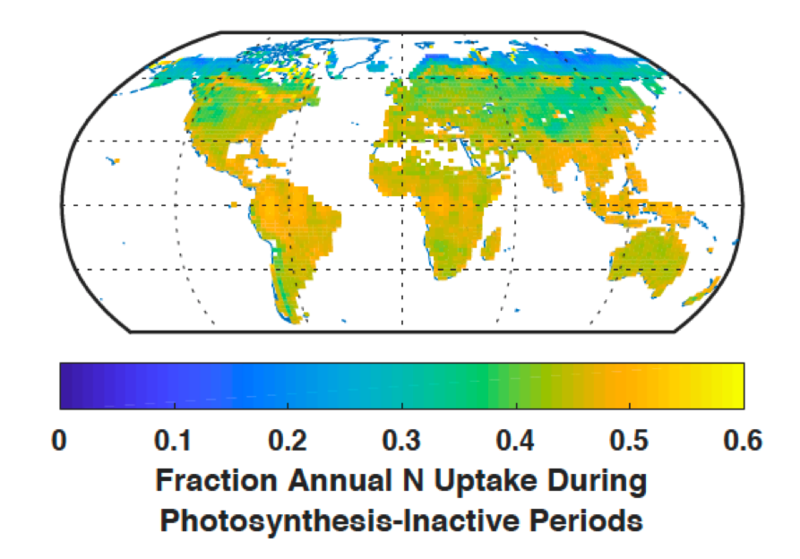 Global nitrogen and phosphorus uptake during photosynthesis-inactive periods account for about half of annual uptake, with large latitudinal variation. The role of terrestrial biogeochemical and plant processes on atmospheric composition is large and uncertain in Earth System Models. In particular, nutrient controls can have very large effects on photosynthesis and microbial processes, thereby affecting atmospheric CO2 and N2O levels. However, most land models participating in CMIP5 and CMIP6 ignore a widely observed phenomenon: plant nutrient uptake in the absence of photosynthesis. In this study, the Energy Exascale Earth System Model (E3SM) land model (ELMv1), which integrates the Equilibrium Chemistry Approximation, is used to represent nutrient competition between microbes, roots, and physical processes. The effects of applying this new approach is compared with the standard method for global carbon cycling (i.e., CO2) and nitrogen losses (i.e., N2O and nitrate leaching). The effects of root nutrient competition with microbes and abiotic processes during periods without photosynthesis is large. Nitrogen and phosphorus uptake during these periods are significant. Ignoring this plant uptake, as is commonly done in land models, leads to large positive biases in annual nitrogen cycles that would result in excessive positive terrestrial feedback (i.e. warming) in the coupled system. Terrestrial carbon-climate feedbacks depend on two large and opposing fluxes—soil organic matter decomposition and photosynthesis—that are tightly regulated by nutrients. Earth system models (ESMs) participating in the Coupled Model Intercomparison Project Phase 5 represented nutrient dynamics poorly, rendering predictions of twenty-first-century carbon-climate feedbacks highly uncertain. Here, DOE-funded scientists use a new land model, the E3SM land model (ELM), to quantify the effects of observed plant nutrient uptake mechanisms missing in most other ESMs. In particular, the global role of root nutrient competition with microbes and abiotic processes is estimated during periods without photosynthesis. Nitrogen and phosphorus uptake during these periods account for 45 and 43%, respectively, of annual uptake, with large latitudinal variation. Globally, nighttime nutrient uptake dominates this signal. Simulations show that ignoring this plant uptake, as is done when applying an instantaneous relative demand approach, leads to large positive biases in annual nitrogen leaching (96%) and N2O emissions (44%). This N2O emission bias has a global warming potential (GWP) equivalent of ~2.4 PgCO2 yr−1, which is substantial compared to the current terrestrial CO2 sink. Such large biases will lead to predictions of overly open terrestrial nutrient cycles and lower carbon sequestration capacity. Both factors imply over-prediction of positive terrestrial feedbacks with climate in current ESMs. Riley, W, Q Zhu, and J Tang. 2018. 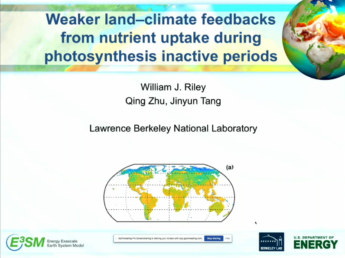 “Weaker Land–Climate Feedbacks From Nutrient Uptake During Photosynthesis-Inactive Periods.” Nature Climate Change, doi:10.1038/s41558-018-0325-4.